Hi there! 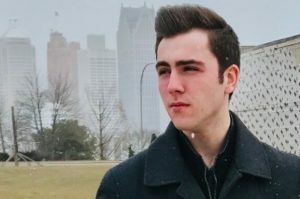 I’m Sean Ross and I’m an 18 year old first-year computer science student at the University of Windsor. I love every aspect of films and filmmaking, and some movies I always return to are Match Point and Airplane! I’m very happy to return as a volunteer with WIFF this year, and I’m excited to be immersed in the culture of the festival. Enjoy yourself—there are some great hidden gems to discover! WIFF Jr. Programmer Sean Ross is recommending RBG and The Guilty as his picks for this year’s festival. If you really want to get a taste for what a film festival is all about, you make sure to see at least one of its featured documentaries. A different look at storytelling, and filmmaking in its rawest form. RBG introduces you to Justice Ruth Bader Ginsburg, a prolific woman serving on the United States’ Supreme Court. This must-see documentary outlines the true story of how ‘The Notorious RBG’ clawed her way up to the top of a previously-male-dominated arm of the government, and how just one woman has impacted the legal system and left her mark on America forever. When an alarm dispatcher answers an emergency call from a kidnapped woman, the clock starts ticking. I am particularly excited to see this dark, gritty drama. Being a fan of crime and mystery films, I am hooked by the premise right off the bat. This Danish film, having won the Audience Award at TIFF, could be your perfect entry point into foreign cinema. I look forward to the bleak atmosphere and thrilling plot!